The TenkaraBum Challenge 2014 stems from the comment "You can catch anything with a black woolly bugger." Personally, I don't think that's true (you might also need a white woolly bugger). Seriously, some fish just eat algae, some saltwater fish eat coral. There are fish you can't catch with a black woolly bugger. Still, it is the genesis for an interesting challenge. First, the fly at the center of TenkaraBum Challenge 2014 is not a woolly bugger, but a Killer Bugger - which is a cross between a Killer Bug and a Woolly Bugger - basically a Killer Bug with a marabou tail. 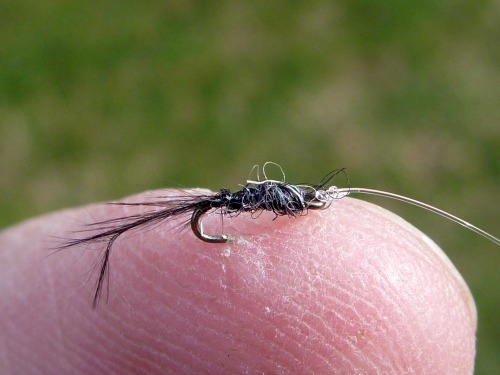 Click for Killer Bugger Step by Step tying instructions. Visit the Black Killer Bugger Gallery to see how the challenge is shaping up so far. I've done extremely well with a Killer Bug, and the Black Killer Bugger has been a success from the very start. So, what can YOU catch with a Black Killer Bugger? The TenkaraBum Challenge 2014 is a species contest. The angler who catches the most species of fish using a Black Killer Bugger wins. 1) The contest begins at 12:01 AM May 1, 2014 and ends at 11:59 PM August 31, 2014. Times are Eastern Daylight Time. Submissions must be for fish caught after the contest starts and must be received before the contest ends. 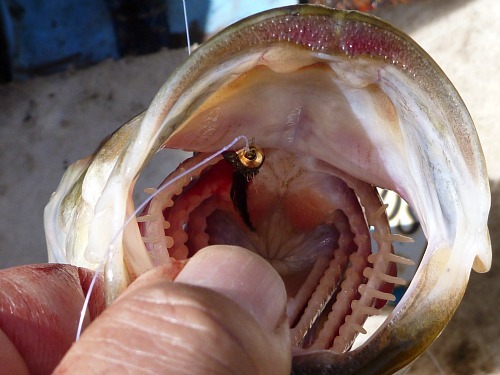 2) Each submission must include a photo of the fish and a photo of the fly, taken before you've fished with it (use your camera's macro setting if it has one) and photos of at least 1 and no more than 3 fish of the same species caught with that fly. If you forget the fly photo, the submission won't count but can be resubmitted with the fly photo. If you have caught several species with the same fly, please upload the fish photo first so the blog entries (which are automatically generated) don't show the same image over and over. 3) You do not have to use the same fly or the same size fly. The fly just has to fit the definition of a Black Killer Bugger. B) Tied with a body consisting of TenkaraBum Black Killer Bugger Yarn. 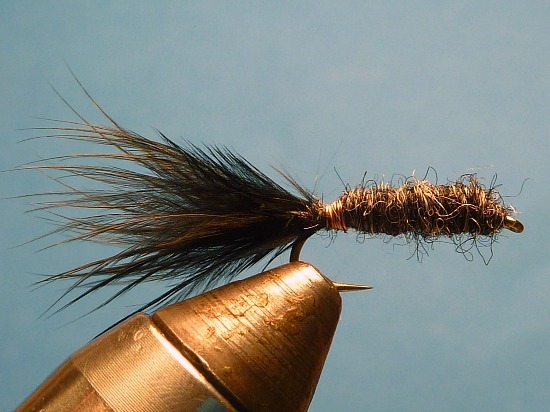 C) Tied with a black marabou tail. A) Tied with copper wire or tying thread (or both). B) Tied with or without a bead head, a cone head, lead or other wire. A) Tied with any hackle, rubber legs, or anything other than Black Killer Bugger Yarn, Black Marabou, wire, thread, bead head, cone head. 5) Only one species per submission, and only one submission per species. If you caught different species with the same fly, submit them separately and upload the same fly photo for each species. 6) You must identify the species. You don't have to be certain and you don't have to be right, but you have to say what you think it is. If you are submitting micros, a photo box helps in identification. If there is any question on identification, I will ask for help from outside experts. After their input, I'll be the judge and the judge's ruling is final. You can challenge someone else's ID, but don't be a jerk about it. I do want to have an accurate contest and an accurate count, though. Send challenges to the Contact Us page. Hybrids count, but a tiger trout does not count as both a brown and a brookie. 7) Black Killer Bugger yarn samples will be given out with each* purchase from TenkaraBum.com from now until the contest ends. (If you start getting more yarn than you want, you can opt out, but you'll probably have to opt out again with each purchase.) In addition to the samples I will send with each purchase, you can also purchase packages of the Black Killer Bugger Yarn directly. Of course, you can also purchase the marabou, hooks, wire or thread (and receive a free sample of the yarn) but you do not have to purchase them from TenkaraBum.com. *If you buy Black Killer Bugger Yarn package(s) or the Black Killer Bugger One Fly Kit, you may receive a bit of Black Woolly Bugger Marabou or a couple hooks instead of getting an extra sample of the yarn. 8) Prize (possibly prizes) to be determined. I'm thinking a T-shirt, but might change my mind. 9) Kiwi has agreed to tie Black Killer Buggers for me, and they may be used in the challenge. They will be available on the TenkaraBum Store - Flies page. I will not get many at a time and they will sell out very quickly. I will not reserve or hold them for even the very best customers. They are strictly on a first come, first served basis. No backorders. If they say "Out of stock" they really are out of stock. No need to send an email asking if they are in stock. Even if they say "In stock" they may have sold out before I got a chance to edit the page to change it. If they won't stay in your cart, they are out of stock. Limit: one order of three flies per customer per day. 10) Each submission must be made using the form below. 11) The rules may change and the challenge may be discontinued prior to the scheduled ending time (neither is anticipated, buy hey, you never know). Click below to see submissions from other anglers. Ice fishing. Used a killer Bugger as a lower fly.. I fished a high gradient, tiny, rocky brook in North NJ and this beauty came on the second cast with a # 26 BH Killer Bugger. I'd caught one of these once before - last fall in the same stream. The only brookie I caught in a stream that usually produces more than just one. Gold tungsten bead size 26 black Killer Bugger did the trick. White bass caught on black Killer Bugger. 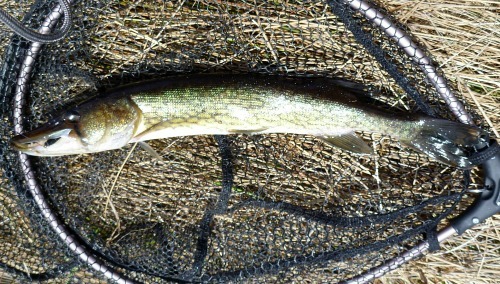 Caught this pickerel while fishing for sunfish. I was using the Nissin SP390, which handled it with absolutely no problem. I started out with a size 26 but found that a size 20 killer bugger was more effective. The tenth species of the day. Second catch in the warmwater stream. We then moved to a warmwater stream, where my first catch was this little Green Sunfish. The second catch of a 10-species day. I've caught common shiners before, but never in spawning colors. Wow! Caught in the same warmwater brook as the other sunfish. Third species caught in a cold water stream. I am amazed that I was able to catch this perch as the sunfish would not leave the killer bugger alone. Caught in an urban pond. 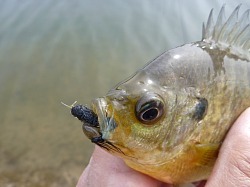 The killer bugger is deadly on bass and bluegills, especially after dark. First crappie I've seen in this warm water brook. One of the 10 species caught that day. Caught in a warm water stream. One of the 10 species caught that day. Caught in warm water brook. Some of the 10 species caught that day. Caught in a high gradient tiny rocky creek. ( Struck out on Brook Trout. It was part of a multiple species marathon day with 10 species caught. Second species caught in a cold water stream. It was a multiple species marathon day with 10 species caught. One of three species caught in a clear cold water stream. Sunday was a many species day. I started out with a fallfish. Here in Florida we find all kinds of non indigenous fish. Hoping to find more. Had some fun in White Oak Creek North Carolina and got this nice wild rainbow trout. The Pumpkinseeds were just as aggressive as the Redbreasts. Black Killer Buggers got hit. The sunfish just couldn't get enough of the Black Killer Buggers. Cast, pause, slow steady retrieve, tug, fish on. Over and over and over. The smallies in Maine loved the Black Killer Buggers! Here's a White Bass from Lahontan Reservoir caught on a size 8 killer bugger. Here's a Common Carp caught on a size 12 Killer Bugger. 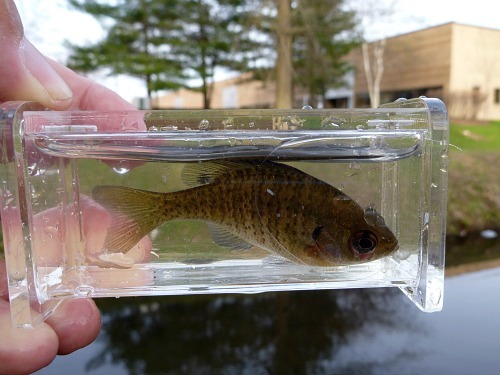 Here's a Green Sunfish from a local urban pond caught on a size 18 killer bugger. Here's a Tiger Trout caught on a size 12 Killer Bugger from a little creek called Desert Creek. Here's a Lahontan Redside caught on a size 18 Killer Bugger in the East Walker River. Here's a Bluegill I caught using a size 14 Killer Bugger. Also caught at Van Cortland Lake, the next cast after the golden shiner. Went to Van Cortland Lake, which is supposed to have quite a few yellow perch, but caught a golden shiner instead. Here's a Rainbow Trout from a local urban pond caught on a size 12 killer bugger. Here's a Sacramento Perch from a local urban pond caught on a size 18 killer bugger. Out fishing with my daughter and caught this nice little spotted sunfish. Caught this Tui Chub in a local high elevation lake on a size 18 Killer Bugger. While fishing for Smallmouth today I caught this pretty little Brown on a size 12 Killer Bugger. Caught this little Smallmouth in the Carson river on a size 12 Killer Bugger. 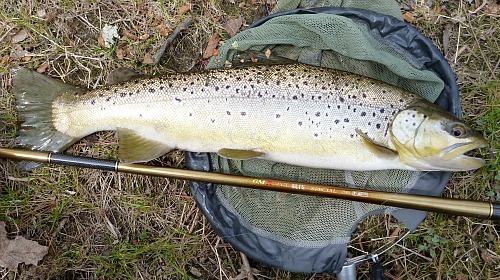 First fish caught on my new Daiwa Kiyose was a nice Cutthroat from a local reservoir on a size 18 Black Killer Bugger. Eastern Sierra Brook Trout on a size 12 beadhead Black Killer Bugger. Here's a Largemouth Bass caught in northern Nevada on a size 12 Killer Bugger. Lots of fun chasing a few bluegill and bass at a small local park lake. Baby bluegill I believe. Caught it on the #26 killer bugger. Think I will put him back for a few more years. Mosquito fish with the micro fly what a fight. At the lake and caught a jeweled cichlid. Who new I would find one in florida lakes? cought this little bugger on the killer bugger in the lakes of florida. Second fish a minute after the Bluegill. Totally unexpected. Had to go home and look it up. First day out on the challenge. Pretty day, pretty lake, pretty fish. Beadhead size 12 Killer Bugger. I purchased several colors of yarn from you and the first fly I tied was the black killer bugger. I did not take any pictures because I was to busy catching large bluegill. This fly is incredible. I almost felt guilty it was so easy. Thanks for a great product. Keep up the good work.